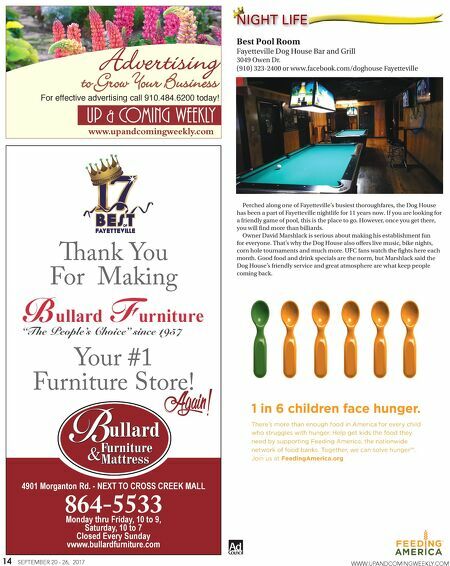 14 SEPTEMBER 20 - 26, 2017 WWW.UPANDCOMINGWEEKLY.COM Best Pool Room Fayetteville Dog House Bar and Grill 3049 Owen Dr. (910) 323-2400 or www.facebook.com/doghouse Fayetteville Perched along one of Fayetteville's busiest thoroughfares, the Dog House has been a part of Fayetteville nightlife for 11 years now. If you are looking for a friendly game of pool, this is the place to go. However, once you get there, you will find more than billiards. Owner David Marshlack is serious about making his establishment fun for everyone. That's why the Dog House also offers live music, bike nights, corn hole tournaments and much more. UFC fans watch the fights here each month. Good food and drink specials are the norm, but Marshlack said the Dog House's friendly service and great atmosphere are what keep people coming back. NIGHT LIFE MEDIA MEDIA 4901 Morganton Rd. - NEXT TO CROSS CREEK MALL Monday thru Friday, 10 to 9, Saturday, 10 to 7 Closed Every Sunday vwww.bullardfurniture.com ank You For Making Your #1 Furniture Store! 864-5533 Again! 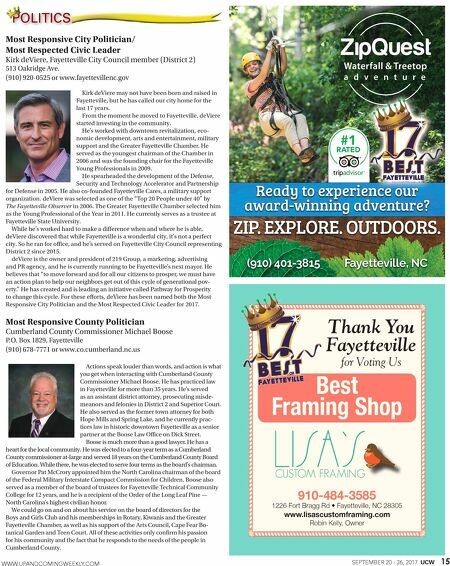 Advertising to Grow Your Business www.upandcomingweekly.com For effective advertising call 910.484.6200 today!